See all Tremont on the Common in Boston. 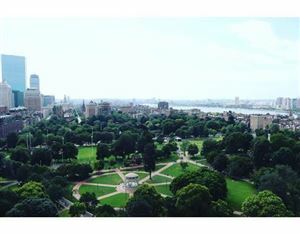 Tremont on the Common is a large high-rise adjacent to Boston Common, offering spectacular views of the Common, Back Bay, the Charles River, Financial District, and beyond. Many units feature outdoor balcony space, overlooking the Common, or the city. An underground parking garage, and a pool (somewhat rare in Boston) are available to residents. Many units at Tremont on the Common also have private balconies allowing you to relax and enjoy the view!